The “right of innocent passage” by seafarers pre-dates Chinese trading junks of the third century B.C. and Greek trading vessels plying the waters of the Mediterranean. Codified in the United Nations Convention on the Laws of the Sea are historical, and still valid, rules of conduct at sea as to the right of unfettered passage. The Geneva Convention on the conduct of armed conflict and modern judicial process conflate with those ancient laws of the sea; those who impede safe passage of seafarers can be summarily executed. 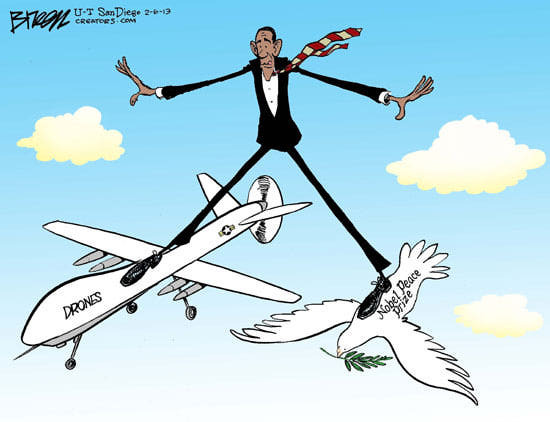 Under a court order the Obama administration released the legal justifications and rationales for the use of armed drones to kill military approved targets (people). The New York Times and the American Civil Liberties Union had pressed the administration for the release of these legal justifications. Responding to pressures, the administration released the memorandum for publication in the press. Traveling under the theory that the government has the right to impose death on its own citizens under the public authorities justification, the memo was released. The “public authorities justification” permits fire trucks to break the speed limits in emergency calls. The “public authorities justification” permits a homicide (the taking of a human life) by police officers. The explanation given in the memo lists “imminent mayhem” as justification under the “public authorities justification” rubric for drone killings. What is not disputed in the released legal memorandum or in other government policy documents, as of yet, is the ancient rule permitting the killing of pirates for acts of piracy at sea. The rule, simply stated, is that a pirate attempting to board a vessel can be summarily killed. By analogy, a person who is in the process of attempting or committing an “act of mayhem” can be justifiably summarily killed, as any pirate attempting or boarding a vessel at sea. In a contemporary legal analogy, Florida’s Stand Your Ground statute can justify an act in self-defense resulting in the taking of human life. The New York Times, in an editorial opposing any non-judicial rational for terrorist killings, approaches the issue from a due process judicial process aspect. How different is the case for summarily killing Somali pirates from the use of drones to kill targets of opportunity in this our war on terrorism? History and politics will ultimately make judgments upon the killings of our times by the use of armed drones. Where do you stand?